Get your Alpena Dark Sky Preserve Parks Adventure Guide HERE!! See the stars of the night sky like you’ve never seen them before! 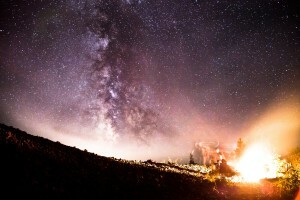 The stars over Alpena as a campfire blazes; photo courtesy of Paul Gerow. sky stargazing.With light pollution readings among the lowest in the Great Lakes region, Alpena is a prime location for viewing the cosmos. At night, the sky illuminates with the incredible glow of the Milkyway. Take your telescope, camera, or just your family and take in a lightshow the level of which only mother nature can provide. See the constellations of the northern hemisphere like you’ve never seen them before. If you’re lucky you may even be witness to a spectacular show of the Aurora Borealis. While stars are visible from the middle of the city, stargazing is best at one of Alpena’s nearby State Dark Sky Preserve parks including Rockport State Park Recreation Area, Thompson’s Harbor State Park, or Negwegon State Park. Rural isolation has its benefits. Being miles away from any major metropolitan area gives northeast Michigan a unique advantage for those who enjoy the mysteries revealed in the night sky. Our lack of concentrated light pollution makes the cosmos appear crisp and clear. Even in the middle of the city you can clearly see all the constellations of the northern hemisphere. A State of Michigan Department of Natural Resources Recreation Passport is required to enter the parks. Just $11 when purchased with in-state license plate renewals. Find out more HERE. 7-Eleven: (989) 354-0970, 650 N. Ripley Blvd. Chisholm St. Full Service Shell Station: (989) 356-2001, 1017 W. Chisholm St. Corner Depot Shell Self Service Station: (989) 354-2512, 999 Long Rapids Rd. McDonalds: (989) 354-5522, 1115 W. Chisholm Street. John Boy’s: (989) 356-0481, 817 W. Chisholm St.
Nick’s Southside Diner: (24 hrs. /Tuesday-Saturday): (989) 358-1955, 3023 US-23 S.
J.J.’s Steak and Pizza House: (7 am-2 am Mon-Sat, 7 am-12 am Sun): (989) 356-1666, 411 N. Second Ave.
Taco Bell: (7am -12am. ): (989) 354-7991, 111 Paddington Ct.
Burger King: (6 am-12 am): (989) 356-3639, 2394 US-23 S.
Rockport State Park, Michigan’s 100th State Park, has over 4,237 acres of land located on the shores of Lake Huron, 11 miles North of Alpena. The property includes a deep-water protected harbor, an old limestone quarry of approximately 300 acres, a unique series of sinkholes, the Besser Natural Area, and a broad range of land types, vegetative cover, cultural resources and recreation opportunities. At the harbor, the DNR has a boat launch facility, and there is a small park with picnic areas. Print out this handy Rockport State Recreation Area Adventure Guide to start your exploration of Michigan’s 100th State Park. Distance from Alpena: 11 miles north of Alpena via US-23 N. to Rockport Road. Follow Rockport Rd to the end. On-site facilities: Vault toilet, picnic area. Closest late-night/early-morning conveniences and distance from park. Call to confirm operation hours as they may change seasonally. Located 26 miles north of Alpena on US 23 North, this natural area encompasses 5,000 acres of sand dunes, upland and marsh. In Michigan there are fewer than 50 remaining examples of “forested wet swale communities” of this quality. The area supports one of the largest known populations in the world of the federal and state-threatened dwarf lake iris, Michigan’s state wildflower. Thousands of iris shoots, and several other plant species of special concern grow in the area. Situated along seven and a half miles of Lake Huron shoreline, this undeveloped park provides a rustic retreat for hikers exploring the park’s six miles of trails. Park at the trail-head off of US-23. Distance from Alpena: 26 miles North of Alpena on US-23 N.
On-site Facilities: Parking area. Vault toilet. McDonald’s: (15 miles): (989) 734-7131, 290 S. Bradley Hwy, Rogers City, MI 49779, Hours: 6 a.m. – 11 p.m. Mysterious, remote and undeveloped, Negwegon State Park is a hidden treasure with 10 miles of hiking trails and one of the most beautiful beaches on Lake Huron. Negwegon is located on US-23, 20 miles South of Alpena. Drivers should be wary of the entry route to the park…part of it is a sandy two-track road. To get to the park, take Black River road off of US 23 to the east 1.5 miles, turn north on Sand Hill Rd. and go 2.5 miles, turn right or east at the Negwegon State Park sign and go 1.5 miles to the day use parking area. No services, back country camping available. Distance from Alpena: 20 miles South of Alpena on US-23 S. Take US-23 S to Wilds Rd. Turn East on Wilds Rd. Wilds Rd. turns into Sand Hill Rd. and then turns East onto Negwegon Park Rd. On-site facilities: Vault toilet, artesian well.